The Shimabara Rebellion was a peasant revolt against Matsukura Katsuie of the Shimabara Domain and Terasawa Katataka of the Karatsu Domain. Fought between December 17, 1637 and April 15, 1638, the Shimabara Rebellion lasted four months. Originally the lands of the Christian Arima family, the Shimabara Peninsula was given to the Matsukura clan in 1614. As a result of their former lord's religious affiliation, many of the inhabitants of the peninsula were Christian as well. The first of the new lords, Matsukura Shigemasa, sought advancement within the ranks of the Tokugawa Shogunate and aided in the construction of​ Edo Castle and a planned invasion of the Philippines. He also pursued a strict policy of persecution against local Christians. While Christians were persecuted in other areas of Japan, the degree of Matsukura's repression was considered particularly extreme by outsiders such as local Dutch traders. 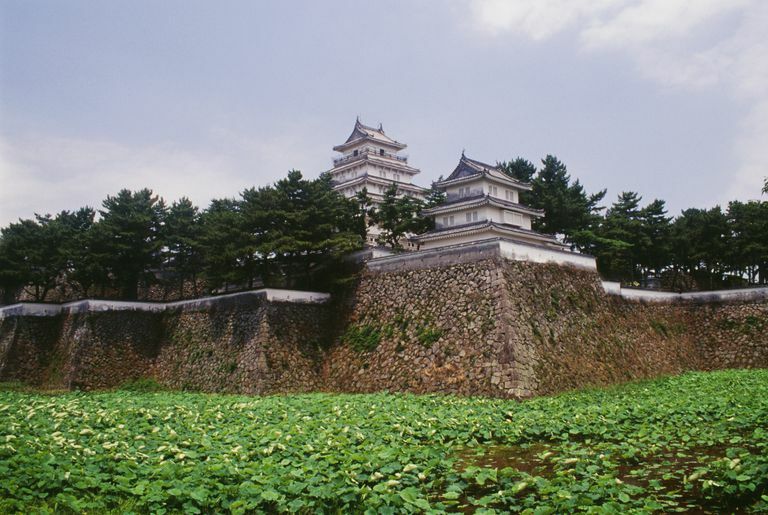 After taking over his new lands, Matsukura constructed a new castle at Shimabara and saw that the Arima clan's old seat, Hara Castle, was dismantled. To finance these projects, Matsukura levied heavy taxes on his people. These policies were continued by his son, Matsukura Katsuie. A similar situation developed on the adjacent Amakusa Islands where the Konishi family had been displaced in favor of the Terasawas. In the fall of 1637, the discontented populace as well as local, masterless samurai began to meet in secret to plan an uprising. This broke out in Shimabara and the Amakusa Islands on December 17, following the assassination of the local daikan (tax official) Hayashi Hyôzaemon. In the revolt's early days, the region's governor and more than thirty noblemen were killed. The ranks of the rebellion quickly swelled as all those living in Shimabara and Amakusa were forced to join the rebel army's ranks. The charismatic 14/16-year old Amakusa Shiro was selected to lead the rebellion. In an effort to snuff out the revolt, the governor of Nagasaki, Terazawa Katataka, dispatched a force of 3,000 samurai to Shimabara. This force was defeated by the rebels on December 27, 1637, with the governor losing all but 200 of his men. Taking the initiative, the rebels laid siege to the Terazawa clan's castles at Tomioka and Hondo. These proved unsuccessful as they were forced to abandon both sieges in the face of advancing shogunate armies. Crossing the Ariake Sea to Shimabara, the rebel army laid siege to Shimabara Castle but were unable to take it. Withdrawing to the ruins of Hara Castle, they re-fortified the site using wood taken from their ships. Provisioning Hara with food and ammunition seized from Matsukura's storehouses at Shimabara, the 27,000-37,000 rebels prepared to receive the shogunate armies that were arriving in the area. Led by Itakura Shigemasa, shogunate forces laid siege to Hara Castle in January 1638. Surveying the situation, Itakura requested aid from the Dutch. In response, Nicolas Koekebakker, the head of the trading station at Hirado, sent gunpowder and cannon. Itakura next requested that Koekebakker send a ship to bombard the seaward side of Hara Castle. Arriving in de Ryp (20), Koekebakker and Itakura began an ineffective 15-day bombardment of the rebel position. After being taunted by the rebels, Itakura sent de Ryp back to Hirado. He was later killed in a failed attack on the castle and replaced by Matsudaira Nobutsuna. Seeking to regain the initiative, the rebels launched a major night raid on February 3, which killed 2,000 soldiers from Hizen. Despite this minor victory, the rebel's situation worsened as provisions dwindled and more shogunate troops arrived. By April, the 27,000 remaining rebels were facing over 125,000 shogunate warriors. With little choice left, they attempted a break out on April 4, but were unable to get through Matsudaira's lines. Prisoners taken during the battle revealed that the rebel's food and ammunition were nearly exhausted. Moving forward, shogunate troops attacked on April 12, and succeeded in taking Hara's outer defenses. Pushing on, they finally managed to take the castle and end the rebellion three days later. Having taken the castle, the shogunate troops executed all those rebels who were still alive. This coupled with those who committed suicide prior to the castle's fall, meant that the entire 27,000-man garrison (men, women, & children) died as a result of the battle. All told, approximately 37,000 rebels and sympathizers were put to death. As the rebellion's leader, Amakusa Shiro was beheaded and his head taken back to Nagasaki for display. As the Shimabara Peninsula and the Amakusa Islands were essentially depopulated by the rebellion, new immigrants were brought in from other parts of Japan and the lands divided among a new set of lords. Ignoring the role that over-taxation played in causing the revolt, the shogunate opted to blame it on the Christians. Officially banning the faith, Japanese Christians were forced underground where they remained until the 19th century. In addition, Japan closed itself to the outside world, only allowing a few Dutch merchants to remain.